Fortunately for Negrita, Foster has a special soft spot for dogs, even street dogs. So there was no way he could leave her to die. We all love our dogs. And this devotion is something we share with the stars. Yes, even the superstars with all the money and all the possessions anyone could desire, value their dogs more than anything. They take them everywhere and make some of them stars in their own right. Six year old saves dogs, hundreds of them! Roman is the little guy who inspired Project Freedom Ride. He loves dogs and he and his mom started making videos at an animal shelter to show just how lovable some of the dogs were. The approach clicked, and then they moved on to helping even larger numbers of dogs who desperately needed homes. No TV weather forecast complete without a studio dog. A TV weather personality in New Hampshire was recently interrupted briefly when the dog of a fellow employee walked innocently onto the set. Viewers loved it! 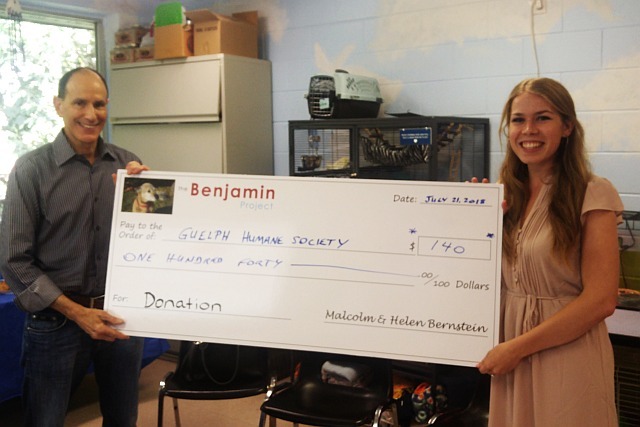 After a successful event at the Guelph Humane Society on Saturday, the Benjamin Project was able to donate $140 do assist the Society in its work of protecting animals. 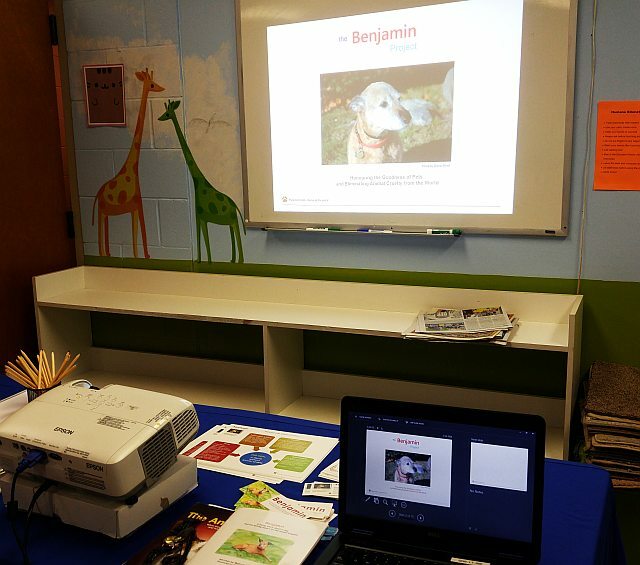 Set up for the presentation on Benjamin’s life and the two books that bear his name. 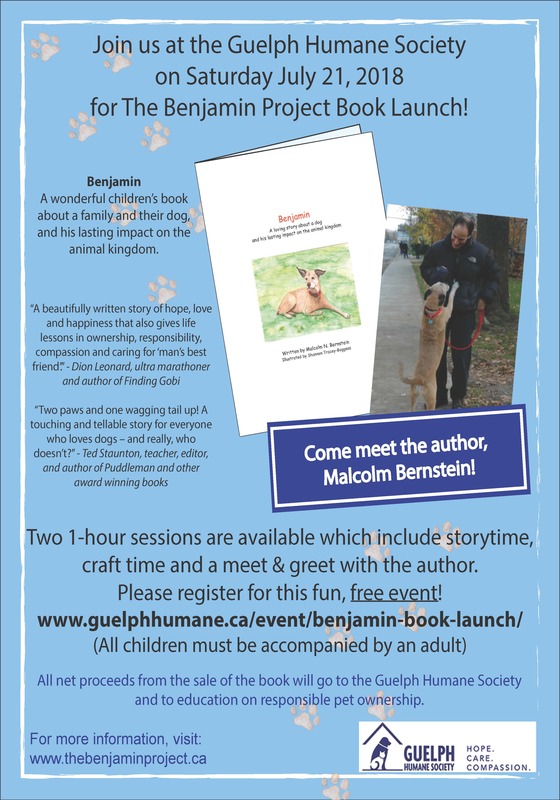 Author Malcolm Bernstein presents a cheque for $140 to the Guelph Humane Society on Saturday. Do animals need legal status as living creatures? 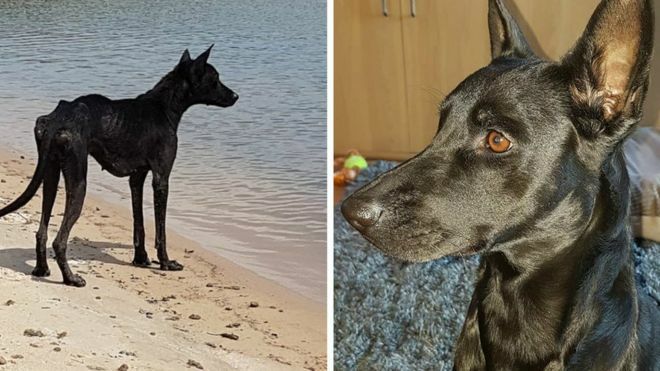 In most countries, for many hundreds of years, dogs and other animals have been only ‘things’ under the law. As things, humans had a right to buy, sell or dispose of them at will. Now one country has taken the progressive step of giving all animals the legal status of ‘living creatures.’ This is a wonderful move as it means that animals will now have a special status or value. The law contains a lot of other good news for dog lovers as well. Ruby is an assistance dog with some special talents. Her human, Rachel, has fibromyalgia and arthritis and moves only slowly with a walker. 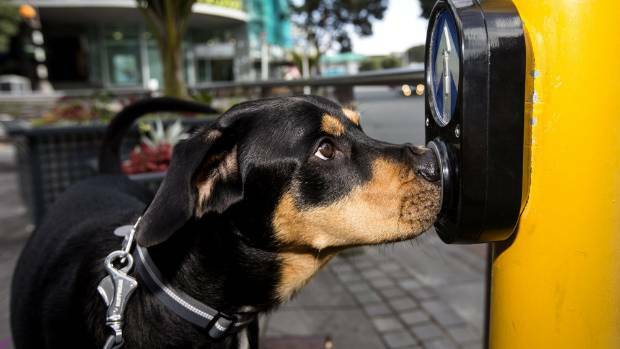 But when they are out and about on their walks, Ruby has learned to push all the buttons. Here’s the sales table for the Benjamin books in the Waterloo Chapters-Indigo book store last Saturday. Visitors were able to meet the author, Malcolm Bernstein, and receive a signed copy of their purchase. 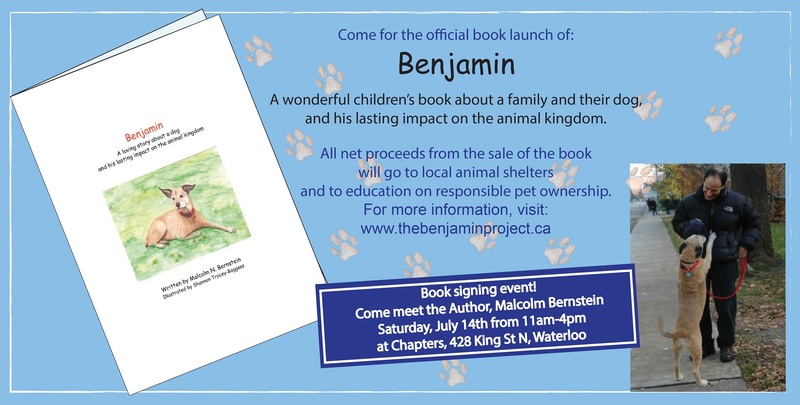 Malcolm Bernstein, author of the new Benjamin’s book for children, will be at Chapters in Waterloo on Saturday, July 14th, between 11:00am and 4:00pm. You’ll be able to meet Malcolm, buy the book for your kids, and have the author personally sign your copy.